An assortment of material to enahnce your game. 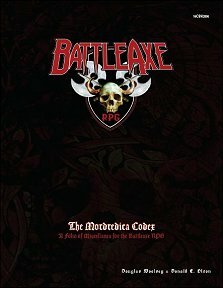 Publisher's blurb: "A Folio of Miscellanea for the Battleaxe RPG! This volume includes new maps and content to add life to your campaigns." Thanks to 16 Coal Black Horses for making this available! Available FREE from the 16 Coal Black Horses website, click HERE to get your copy.